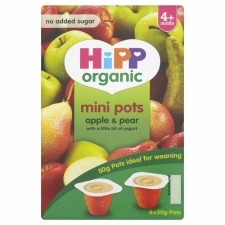 We have kindly been sent the new HiPP Organic Mini Pots for Leo to have a taste of, this fab new line was launched just last month, and they are perfect for the initial introduction to solids as they can be used from 4 months onwards. Mini Pots will be positioned in the market as the perfect format for introducing solid foods to babies. Made from the finest organic fruits, picked at the peak of ripeness and blended with a ‘little bit of organic yogurt’, they are available in two flavours; ‘Apple and Pear’ and ‘Banana and Peach’. Mini Pots are available in packs of 6 and the 'little bit' of yogurt makes the whole taste experience smoother and the taste milder to suit a younger baby's developing palette. We started weaning Leo a few months ago now, he was a hungry baby and began to really love his food. We started off with baby porridge and as the weeks progressed we started to introduce Vegetables and Fruit. These new Mini Pots would have been a brilliant way to start Leo off, he is now on 3 meals a day, and as of today he has been enjoying HiPP Mini Pots as snacks after his meals. Leo has given the HiPP Organic Mini Pots a BIG thumbs up, and when we have eaten our way to the bottom of the pot...he has smacked his lips readily together and searched for more! These pots happen to be conveniently sized in 50g pots as HiPP have listened to our Mummy voices and reduced the sizes to avoid wastage... I am sure I am not alone in feeling annoyed when there is lots of food wasted during the weaning of a baby. Whilst an abundance of 100g fruit pots are readily available in the baby food market, research has revealed that consumers find the product size too big for first time tasting experiences. HiPP Organic recognised this untapped demand for a smaller serving, which led to the launch of two Mini Pot variants of pureed fruit ‘with a little bit of yogurt’ in 6 x 50g pots. What I really REALLY love about the Pots are the fact they do not need refrigerating! I am one of those Mummy's that is always on the go and packing Leo's lunch into his changing bag and heading out of the house for the day! This makes it easy to keep the food fresh, provide Leo with a healthy organic treat, and also get Leo's 5 a day in him! 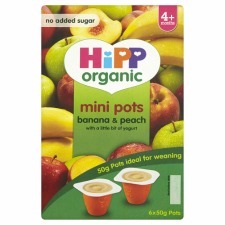 HiPP Organic Mini Pots are available in Tesco, Sainsbury's, Waitrose and Boots right now. So if you fancy a wholesome yummy treat that your baby (and you....) will enjoy, then give them a try today!